A valuation for ASC 805 is an appraisal that determines the fair value of the assets acquired, liabilities assumed and non-controlling interests in the acquiree as part of a business combination. In July, 2009, when the Financial Accounting Standards Board launched the Accounting Standards Codification (the FASB ASC), the FASB ASC replaced all previously existing financial accounting standards (other than U.S. Securities and Exchange Commission pronouncements) to become the single source of authoritative nongovernmental U.S. generally accepted accounting principles. Going forward, instead of issuing new standards (e.g., SFAS 142), the FASB will issue updates to the FASB ASC. Who is expected to comply with FASB ASC 805 "Business Combinations" (formerly SFAS 141R)? Any company with GAAP-based financial statements that is contemplating, or has recently entered into a merger or acquisition is affected by SFAS 141 (now referred to as ASC 805, Business Combinations). In addition, the codification explains the procedures for determining the fair value of goodwill under SFAS 142 ASC 350 "impairment testing". When did ASC 805 become effective? The codification became effective for fiscal years beginning after December 15, 2008. ASC 805 applies prospectively to business combinations with an acquisition date on or after the beginning of the first annual reporting period beginning on or after December 15, 2008. What are some of the little known valuation requirements under ASC 805? One of the little known changes brought about by ASC 805 deals with accounting for contingent assets/liabilities. These contingent considerations may or may not be paid depending on the resolution of certain future events. Under the old rules of FAS 141, contingencies were not recognized until resolved. Under the new codifications, contingencies are to be measured at fair value on the acquisition date. The pronouncement calls for contingencies to be divided into two categories: contractual and non-contractual. Contractual contingencies (such as a warranty) are measured at their estimated fair value as of the acquisition date. Non-contractual contingencies (e.g. lawsuits), are to be measured at fair value only if it is determined that the liability is more likely than not to exist (i.e. probability > 50%) as of the valuation date. Another often missed valuation modeling item relates to Transaction Costs. Under the original SFAS 141, transaction costs, such as legal and other acquisition closing costs, were included and capitalized as part of the purchase price. SFAS 141(R) requires that transaction costs be expensed. What are some of the Book and Tax differences involved in Purchase price allocations? M&A transactions have different rules and procedures for allocations of purchase price under US GAAP and US federal tax. Fundamental differences between financial reporting and tax reporting exist, as shown in some of the following examples. What types of assets has Cambridge Partners valued as part of an appraisal for business combinations (either ASC 805 or US tax allocations)? Machinery and equipment utilized in manufacturing. This includes equipment associated with food production, automotive, manufacturing, retail, healthcare and power generation, among others. 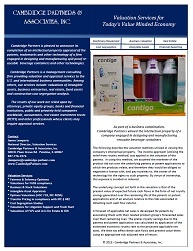 Patented technology for a leading manufacturer of water filtration products. Trademarks, trade names and service marks for a consumer brands company. Franchise agreements, leasehold interests, owned real estate, equipment, leasehold improvements and many other assets for the 2nd, 6th and 88th largest food franchises in the world. Customer mailing list containing several million customer names for a 1000+ store retailer. Customer relationship intangible assets ranging from as few as a single customer account to thousands of customer accounts. Power purchase agreements and conversion services agreements between energy/power producers and utility purchasers. Fair value determination associated with leasehold improvements of a portfolio of office buildings. Real estate valuations of numerous industrial coatings and paint manufacturing facilities in Europe, North America and South America. Equipment valuation of various plant assets and tooling utilized in the manufacture of OEM automotive parts. Favorable franchise agreements and foregone franchise fees. ASC 805 valuation of Employment and non-compete agreements with selling shareholders and other key management. Non-operating assets acquired as part of a business combination, including ownership interests in business partnerships, non-operating real estate, equities, company airplanes, etc.